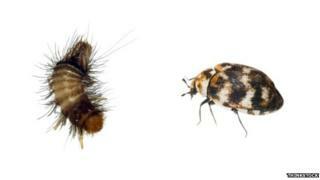 A museum invaded by carpet beetles has appealed for the loan of a walk-in freezer so they can be wiped out. Evidence of carpet beetles and their "munching" larvae has been found on clothing at the Old House Museum in Bakewell, Derbyshire. It was in an area used for the museum's best clothing. The museum has started to freeze batches of clothing in a chest freezer but said a walk-in one would speed the process up. Museum manager Anita Spencer said: "They love carpets, they love textiles, it's just a fabulous menu for them to munch on, so we are determined to get rid of them. "I think it's going to be a major problem with museums in the future because of climate change. "Mild winters, wet springs, hot humid summers: it's a perfect environment for beetles." The museum is based at a house dating from 1534 that was originally the farmhouse home of a tax collector. Industrial Revolution entrepreneur Richard Arkwright later converted the house into cottages to accommodate his mill workers. Many of the displays are of lace, textiles and clothing - all ideal food for carpet beetles. Nicky Crewe from the museum said: "Carpet beetle strikes dread into the heart of every museum curator and conservationist, but actually we think we are very lucky in that we have caught it early. "You can have quite an infestation because they lay eggs, and then those munch away. "It's the fact that it can spread and it can spread quickly."